I haven’t been to the Aberdeen food court in a long time and it’s as busy as ever! I was craving some Chinese comfort food because it’s bulking season and I have my eyes set on carbs! This time I hit up Leung Kee which offers great HK style food for a great price! They offer all the classic HK style cafe dishes that you can think of. The line here was almost as long as Bubble Waffle Cafe. This entry was posted in Asian, Chinese, Food Reviews and tagged Aberdeen food court, rice rolls, sticky rice. 8 Juice has been in the Aberdeen food court ever since it opened but I was never compelled to try it. Maybe it was the higher price point relative to it’s neighbour Estea, or the fact that I had never had an interest in juice before when powdered fruit-flavoured bubble teas seemed to satisfy all my cravings already. 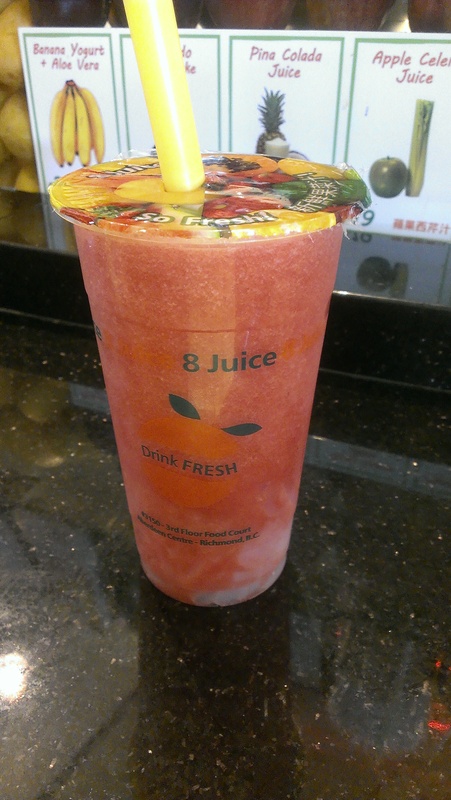 8 Juice offers drinks in small, medium or large in a variety of fruit flavours. They have a huge display of fresh fruit behind their counter! You can also order up to two flavours in one size without being charged more. Unfortunately I only read that after I had ordered. =_________= Oh well. Also if you want to have add-ins like grass jelly, coconut jelly or mango stars, that will cost you an extra $0.57. My friend had the Watermelon Juice with Coconut Jelly. This drink was sweeter than mine and my friend commented that the sweetness from the coconut jelly overpowered the watermelon flavours. When I tried it, he was right indeed. I don’t mind though since I like sweet things! Also, I found my grass jelly rather bland after trying the coconut jelly. It’s all relative! I also have to admit I’m not even much of a grass jelly fan but I was feeling up for some variety. This entry was posted in Fast Food, Food Reviews and tagged 8 Juice, Aberdeen food court, fresh juice. I love how the Aberdeen food court has pretty much every type of Asian food you can think of. I stopped by after school to grab some snacks with a friend. It was a bright sunny day and a nice cold drink would be perfect. 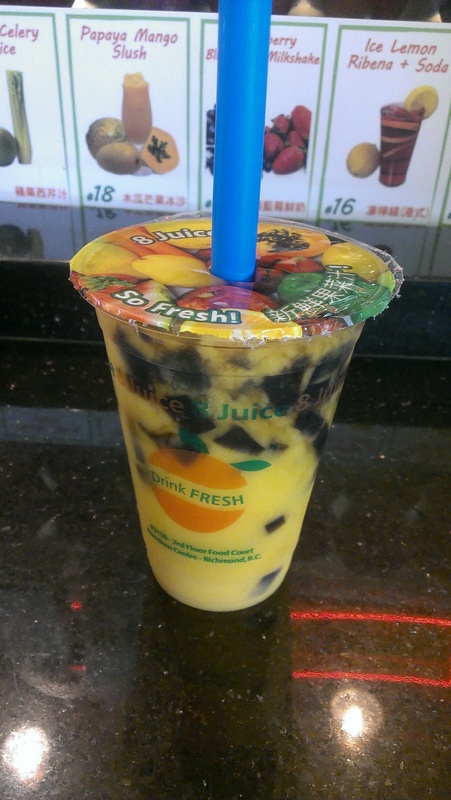 The only bubble tea place was Estea so I didn’t have much of a choice but I’m not too picky. After staring at the menu indecisively I decided on a peach slush. They offer a selection of standard flavours and some fresh fruit flavours as well. 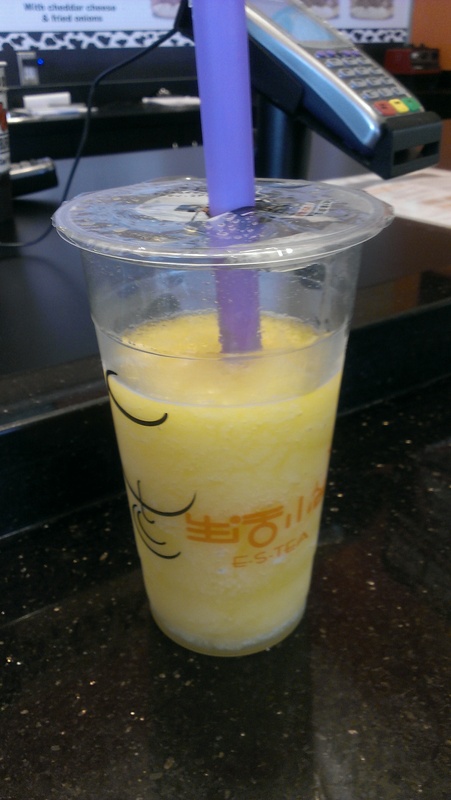 It didn’t have much peach flavour at all and was mostly just sweet but pleasant enough for $4. Then I had an intense craving for fries! 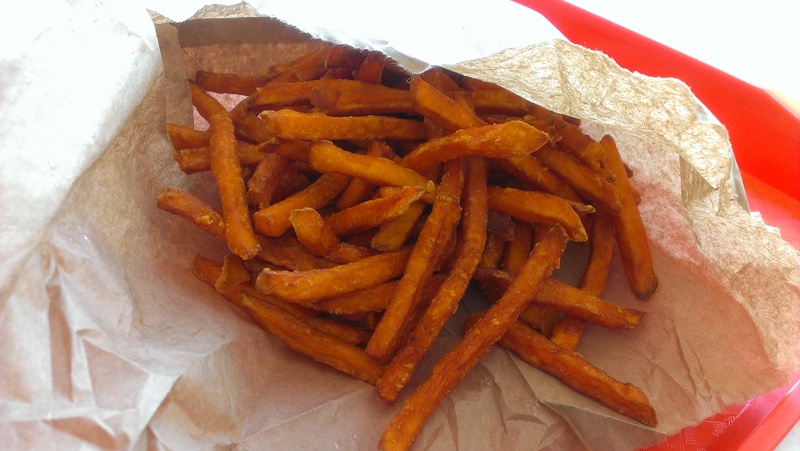 Since Vera’s happened to be there we went for their yam fries. Located in the corner next to Teppan Kitchen, it didn’t seem to get a lot of business. Their kitchen looked super clean and unused too. We had to wait a while before anyone came to serve us. For $6 this was a nice portion of fries. The fries were skinnier than I liked them to be but rather crispy and not limp. I also noticed that it wasn’t that greasy either since they served it to us in a paper bag, it wasn’t greasy afterwards. However, I thought they were lacking in flavour somehow and the garlic aioli wasn’t spicy either so I was a bit disappointed but it did the job. I’m really not sure how Vera’s manages to stay in business in this super Asian food court though. This entry was posted in American/Burgers, Food Reviews and tagged Aberdeen food court, bubble tea, Estea Express, Vera's express, yam fries.